The Crochet Stitch Dictionary by Sarah Hazell contains 200 crochet stitches and includes a photo of the stitch in a fabric swatch, description of the stitch, photos of the major steps, detailed text steps, and symbol charts for each stitch. Each section uses a different color yarn and the symbol charts follow the same color, i.e., yellow yarn used in photo and yellow ink for symbols, which is neat but also means that some of the symbols are a little difficult to see because the ink color is too light or too pastel. It would have been easier on the eyes if they’d stuck with alternating rows of black and blue or red. In contrast, the yarn used in the photos has distinct strands and a nice twist which shows off the stitches well. The book starts with a table of contents with thumbnails of each stitch and a Getting Started chapter which includes equipment and materials, essential crochet skills, basic stitches, and stitch variations. Following are the main chapters covering basic stitches like single, half double, double, treble, woven, sieve, etc. ; fans and shells; puffs and bobbles; relief stitches; mesh, filet, and trellis; crossed and interlocking; and waves and chevrons. At the end of the book is a symbol and abbreviation glossary along with an American/English equivalency chart. 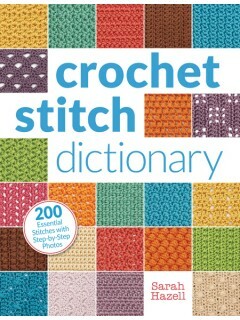 This book covers most of the basic stitches along with a lot of popular/favorite stitches and is a good reference to have in your library. Some basic stitches that weren’t covered that I would have liked to have seen are the extended single, half, and double crochets along with a foundation single crochet and foundation double crochet but I guess I can’t have everything.